Former Chairman of NATO Military Committee and Chief of Staff of the German Federal Armed Forces, General (ret) Klaus Naumann—member of the International Advisory Board of the World Security Network Foundation—after his visit with the SACEUR in Afghanistan: "First priority is a clearer concept of reconstruction, a better coordination between NATO, the UN and NGOs and a still missing coherent campaign plan"
Former Chairman of NATO Military Committee and Chief of Staff of the German Federal Armed Forces, General (ret) Klaus Naumann in an exclusive interview with WSN president Hubertus Hoffmann on his Impressions from Afghanistan and What NATO Should Do Now. Hubertus Hoffmann: You just returned from Afghanistan from a trip with NATO Saceur General Jones, what are your main findings? Klaus Naumann: We maybe overburden the Afghan government and its people with our Western proposal of a central government, which this country has never had in its history before. Over centuries, there was always a competition between the rulers in Kabul and the local tribal areas. Now, the West, led by the United States, has imposed on Afghanistan a central government, which was made responsible for everything. If you ask them about their ideas of how to rebuild Afghanistan, you mostly get different vague ideas and nothing concrete. Our first priority: we now need a clearer concept of reconstruction; you need this for investments to build up the economy, to create jobs and create long-lasting stability—and a safer future for the government. Issue number two is security: The good news is that two thirds of the country is more or less secure. The rest is still combat area to be made safer in order to attract investors into Afghanistan. Priority number three is a better coordination between NATO, the UN and NGOs. A lot of aid is poured into the country, but it is not coordinated. There is still no coherent campaign plan. And NATO has been in Afghanistan for three years. Hubertus Hoffmann: What can NATO do now? Klaus Naumann: NATO is now at a crossroad. It has been asked to take over the operation “Enduring Freedom” from the Americans, but some elements of it should remain solely US organized. It will complicate command and control. Based on my experience, that will not work; it could create frictions and tensions as seen in the former Yugoslavia. There is a good tradition in the military, like the US Marine Corps puts it: “keep it short and simple !” The proposal now is neither simple nor a quick fix. NATO still has to do some homework. The NATO commander is asked to run the operations in Afghanistan without any reserves—a contradiction to all military experience. NATO needs much more air transport capacities as well to redeploy its troop in that difficult terrain. The operational planning today is a little shaky. Maybe it is not wise to call Afghanistan the “test case” for the 21st century. Hubertus Hoffmann: Which role does Pakistan and its secret service ISI play now? Klaus Naumann: "NATO is now at a crossroad in Afghanistan. It needs more air transport capacities and must have reserves. The discussed new structure of NATO and US forces must be simple to work." 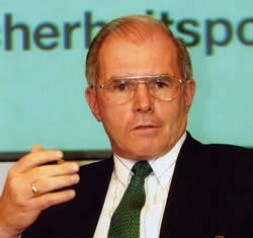 Klaus Naumann: It is obvious that some people in the Pakistani establishment and the ISI—who supported the Taliban prior to 9/11—still believe in the idea that from the Pakistani point-of-view Afghanistan is their “hinterland” in its strategic disposition to India. As long as this idea finds support, the Pakistani backing of the Western influence and the new concept for an independent Afghanistan will be unclear. Pakistan’s President is committed to fighting the Taliban, especially in the tribal areas between the two countries where they regroup and regain strength. NATO and US commanders argue: We know where the Taliban are, we fight them and are confident we will win. But the Taliban still win in recruiting young people, especially in the Koran schools. They use their propaganda very efficiently in the rural areas where only 15 percent of the population can read and write. One of the very simple but effective Taliban propaganda is: The handover from the US to NATO means in reality a withdrawal of the United States and that the Taliban has won the war against the US. We need an information campaign. And the Taliban are fighting “the foreigners” which has been a tradition in Afghanistan for 1000 years. Historically they have always been successful, for example, against the British and later the Soviets. Hubertus Hoffmann: Which role does poppy production play strategically? Klaus Naumann: The farmers do not have so many alternatives to poppy planting as their main source of income. A good one is the production of rose oil, which can be sold with a nice profit. Much more profit is being made by the warlords and drug dealers, so NATO has to face these two powerful groups as well. One good step was the “fatwa” by the Islamic leaders against drug production as being against Islam and the spraying of poppy fields by the Americans. But so far, not much had been done by the British who were made responsible for this problem according to the Petersburg Conference. 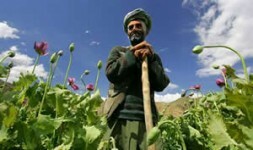 One option is to attack proactively the convoys of the drug dealers which can be easily be spotted; this is not directed against the Afghan people, as the drug dealers have paid the farmers already. Hubertus Hoffmann: Which role do the German forces play in Afghanistan? "So far, not much had been done to stop poppy production. One option is to attack proactively the convoys of drug dealers which can be easily be spotted." Klaus Naumann: The Germans are doing a good job although improvements would be possible if help and security were in one hand, if there were not such a rigid separation of responsibilities and if the bureaucracy which has to authorise the flow of cash were working faster. Whether it is wise to withdraw more or less from Kabul as the centre of power is an open question.